Office Cats Increase Productivity – Cats work as stress relievers! Sounds like an ideal co-worker next to your desk? Absolutely. Growing numbers of offices adopt kittens and enjoy its benefit. What’s the best way to increase efficiency at your office? Let’s take a look at why you should have a cat at your workplace. Servant H is at the desk writing something. Johnny comes in. What are you up to, H? Same all, same all. I’m writing stuff, your majesty. It’s about increasing productivity by having a cat office. 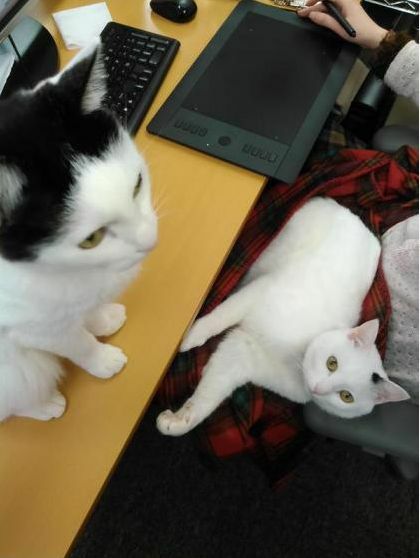 Having feline friends at workplace increases efficiency on business. Do you know why we cats increase productivity among you humans? No, not really. That’s what I’m researching now. Let me be your help here. When our expectations are not met by clients or ourselves, we feel stress. When things are not going in our favor, we feel stress. When we feel we are pushed, we feel stress. But as long as we are in some kind of business, we have a goal to meet and deadline. We need a certain level of stress to work efficiently. When we feel stress, stress hormone is produced. At first, we try to fight back against it, but after a while, we freeze. It is like we open too many windows on the laptop, can’t handle all of it, it stops working as well as our brain. Excessive stress level cause higher absenteeism, lower engagement hence the lower productivity among employees. As HelpGuide.ORG suggests, in order to reduce stress level, you can work on improving communication among employees and cultivating a friendly social climate at the office. This is where cats can come in the picture. A Cat can lower your stress, blood pressure level, as well as anxiety. But how? You can imagine merely watching them make you smile and gives you a moment of relief. Stroking a cat is among the best as it produces Oxytocin in your body and it kills stress. When we feel happy with people around, chances are our body produces oxytocin as well as serotonin increases the sense of happiness. As serotonin plays a key role in one’s mood, both of them are closely related. Oxytocin is known as a key player in maternal bonding and social affiliation, it leads and maintains good social bonds. When oxytocin is in the bloodstream, it means it encourages physiological change and it might encourage people to seek contact with others. Also, there is a study that implies oxytocin might influence social behaviors such as trust and generosity. Oxytocin inhaled participants tended to be generous with others in their experiment. So that if interacting with cats promote oxytocin in humans, it is no wonder they have more communication with each other and have trust one another. But there is more. When we interact with cats, we don’t share the same language we can speak. But you can understand them by reading their body languages, we interact with them in non-verbal communication. What’s amazing about non-verbal communication is it can go deeper in your heart. It can touch where words can’t reach. Stroking cute kittens is one of the best ways to reduce stress. And its act itself promote producing oxytocin and make people easier to trust and to be generous to others. The friendly environment can promote more commitment to co-workers, hence increase productivity. You see? Having a cat at office benefit hugely! You are so right, your majesty. You have me at your workplace so your productivity should be much higher. Be more creative and increase your productivity, H! Having a cat at office reduce stress level among employees by promoting oxytocin. It’s said it encourages people to trust each other and have more communication. As too much stress cause lower productivity, relieve stress plays a big role and cats take that role. Hence having cats increase productivity. There are concerns there may be some have a cat allergy, some may not like the idea of having a cat in a workplace. But taking them into account and still, there is a lot of benefit having kittens at your office if you want better communication and greater productivity. 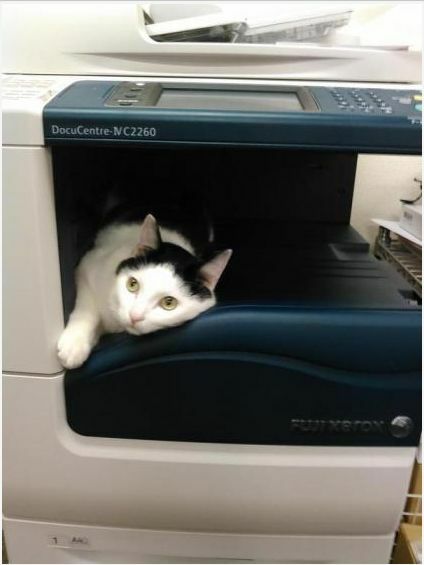 A lot to overcome before you apply a cat-friendly policy to your office? Neko Atsume is always on your side.